Another successful Golf Tournament was held at Calgary’s Fox Hollow Golf Course with thirty-eight golfers and four others helping out with registration. Registration went smoothly with Cindy N., Cathy M., and Tina H. running the show. Thank you gals!!! Cathy and Steve M. had put together Welcome Packages for all of the golfers, which they received after registering. Thanks goes to both of them for letting the golfers start out with a great package! Carts were assigned and decorated by everyone and the judging of the Best Decorated Cart was done by two war veterans that were there to represent the charity we chose, “Canadian Legacy Project”. Interestingly enough, one of the veterans, Roger, was from the United States who had served in the Vietnam War and is now living in Calgary, and the other, a Canadian vet, Mike, who had served for several tours in Afghanistan, Ethiopia, and Bosnia, and is suffering from P.T.S.D (See this CFCN Calgary Link) were our judges. The Marshal of the course was pleased with everyone and thought that all of the carts really showed off our character as a group. We played 9 holes using the Best Ball. There were competitions for our golf tournament that were filled by many. The Best Scoring Group consisted of Gord C, Dale G, Steve M, and Kevin W, all who are long time Parrot Heads of our club. Congratulations go to all of them! An additional competition was the Best Dressed Parrot Head! Many were decked out with flamingo hats, tropical shirts, hula skirts, beads and leis, Parrot Head tailgate decorated hats and so much more! Interestingly enough, the top five were all dressed as Pirates! It came down to the hand held over each and who got the loudest cheering! Ken won! The others in the line up were decked out with a parrot (stuffed, with a pirate hat) on one of their shoulders, and another with a pirate puppet! Let’s not forget the new member, Craig, with the coconut bra and grass skirt! Too much PHUN! Everyone had four tasty options for dinner at the clubhouse as soon as they were finished golfing or whenever they wanted to place their order. The meals were great and all the staff at the golf course was exceptional! Golf stories were shared as the libations were disappearing. We had Jimmy Buffett’s tunes blasting both on the course as well as in the clubhouse for all to enjoy! The 50/50 Draw was also a success, thanks to Rob C. and Janice L. for doing such a great job selling them, and you would never know that forty of us could raise so much for the charity! The winner of the 50/50 Draw was Bonnie M., who re-donated her winnings. This was a very generous gesture and not one that we expected, at all! Thank you Bonnie! We tried something new this year to raise more funds. Besides the selling of Mulligans and the 50/50 Draw, this year, we had Raffle Draws. We went expecting to have two draws, but ended up with four as Fox Hollow donated some items and a member brought a huge, basket of freshly dug and cleaned veggies from his garden! Thank you to everyone who bought tickets for these four draws! An enormous thank you to Pam W., Pottery Barn, Williams Sonoma, Gord C., Wayne W., and Fox Hollow for these wonderful gifts! The Canadian Legacy Project ( http://www.canadianlegacy.org/ ) will be receiving a cheque through presentation at a later date as we are also going to have our November Happy Hour raising funds to add on to this amount. Hopefully, the two vets that were at the tournament, Roger and Mike, can be there as well. The Canadian Legacy Project was developed to be an organization that advocates for our veterans and supports them by creating programs and events to help improve their everyday lives. All in all, it was one of our best golf tournaments! Thank you to all who entered the tournament as well as the volunteers and organizers (Dustan B., Steve M., Joyce B., Gord C., and Greg from Fox Hollow)! Something like this doesn’t just happen without hours and hours of work behind the scenes. Fins up to all who helped, and participated! Another successful Spring Phling has passed and we are so proud to announce that we raised $3908 (with more to come; discussed later) for STARS Air Ambulance. This is awesome! Original Joes-Avenida was full of very generous Parrot Heads who bid on twenty- two Silent Auction items, bought (just under 920) 50/50 tickets, purchased fifty ocean coloured balloons at twenty dollars a balloon with the hopes of winning a beautiful Red Cedar Planter Box, with two Scarlet Begonias, which was designed, made, and donated by two of our own parrot heads, Leann and Murray. Trying to find room on the dance floor was a bit tricky at times with the pH Unbalanced Band belting out tunes that everyone seemed to enjoy. There was another impromptu conga line that threaded throughout the bar, picking up patrons as it went past them. We had pirates dancing with hula girls! We had Fins to the Left, and Right! We had smiling faces from all directions! We really do know how to Party With a Purpose! 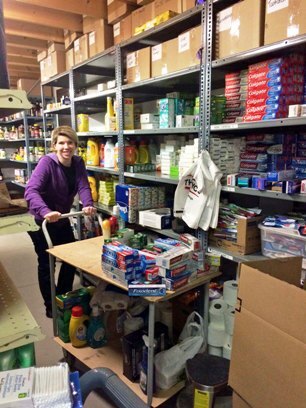 A huge thank-you to everyone who donated items for this event! Additional note: STARS will also be the beneficiary for our June 24 Happy Hour. We knew it was worthy for raising money, but when you hear first hand of what STARS does, like what Lorna at the Spring Phling told us she went through, you know it is worth every cent. What a wonderful evening Saturday Dec. 9  turned out to be! The weather was here!... That’s for sure! With all of the proceeds going to Inn From the Cold – Calgary, I am very pleased to let you know that we raised $3764.00! There is no doubt that this amount will help to make this time of year a little bit easier for those families that are in need of assistance. First of all, we all supported this charity by coming out to party with a purpose,(Thank you) because that is just what we do.... as well as bidding on the 23 silent auction items, buying all 50 balloons for $20 each, hoping to win one of the two draws worth approximately $650 each, buying up the 50/50 tickets and making the actual winner walk away with $410, and a huge smile across her face. The 50/50 ticket sales was also a record breaker!! You all conga lined, twice, and partied with the purpose of having a great time! The Shotzski did not sit idle for any length of time, and from my view of the evening, everyone seemed to be having an excellent time. I would like to thank everyone who has contributed towards the silent auction items. I wouldn't have been able to put together all of those baskets without your contributions. Also, a thank you to John & Marion, Janice & Rob, Tom, and Colleen for helping out with the Balloon Draw; Eva & Roy, Bev & Derek, Cathy & Steve, Ashlea & Shane for decorating, Eva & Roy for making, and selling, all of those 50/50 tickets, Wendy & Marvin, Lorrie & Kevin, Karen and Janice, and Janice & Yves for taking care of the tickets at the door. I also would like to thank Bev and Cindy for offering next year’s memberships. You will be able to purchase them at the 2018 Happy Hours as well. A huge thanks to Derek for going around to everyone with the membership sales rather than you trying to catch up with the gals. There is no possible way that this Christmas “Party With a Purpose” would have even happened without all of their help, and your attendance. It is appreciated very much! Cheers to you having a safe holiday season everyone! The “Bored” Members would like to wish you all a very Merry Christmas and a healthy and prosperous 2018! The Fire Fighters Burn Treatment Society was very appreciative of the funds we raised for them from the 50/50 draws at the January Happy Hour. 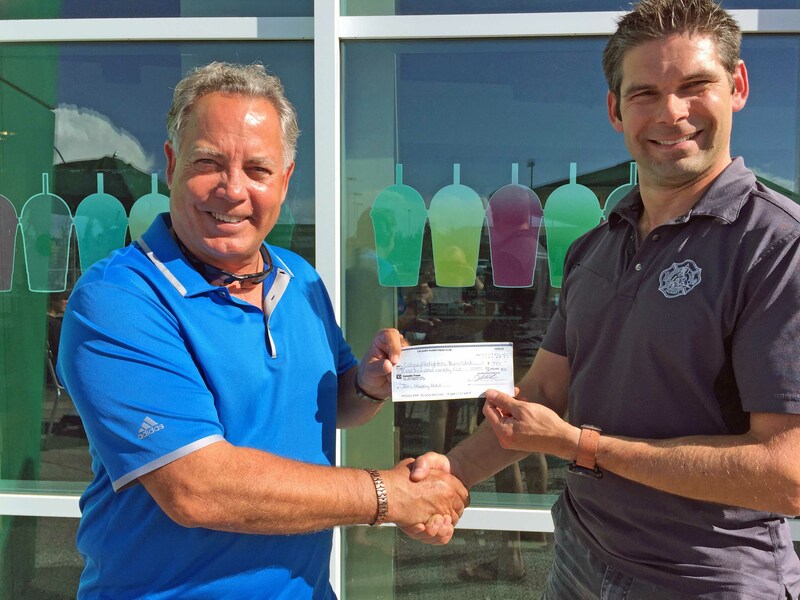 Shown here is a picture of the cheque presentation from Derek D. to Thomas K. of the society. Thanks to the 50/50 and Raffle Draws during the March Happy Hour (Dockside Pub) we raised $332.00 for GrowCalgary, an urban farm that grows produce for our local food banks and other related services organizations. 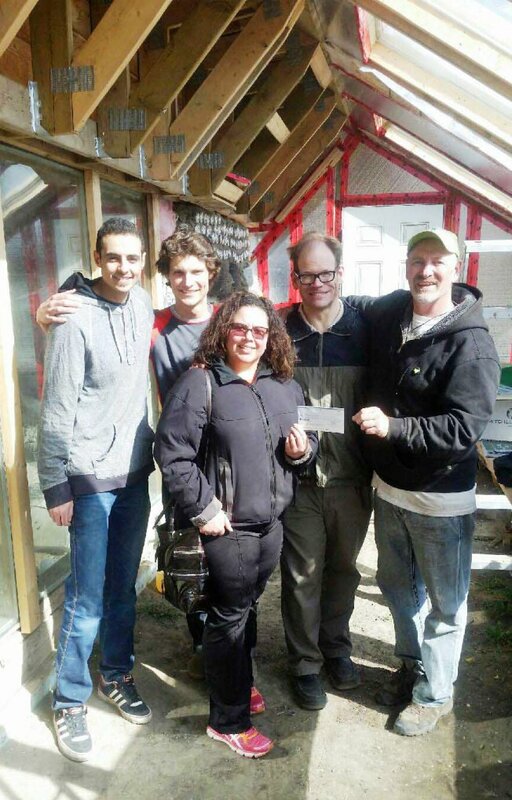 Here, Maria M. is presenting the cheque to Paul Hughes (far right), the founder of GrowCalgary. This took place in the "Earthship", a special experimental greenhouse to allow for a 365 day grow period. 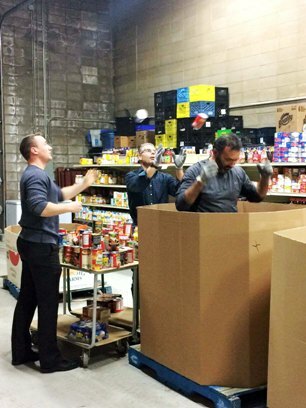 GrowCalgary was very appreciative of our donation. Yet another beneficiary of our "partying with a purpose!" Thank you to everyone who came to our 20th anniversary Christmas Phling event on November 26, 2016, and what a party it was! We managed to collect 4 (oversized) food hampers worth of food and the total amount raised for the Veteran's Food Bank and Wings of Hope was $2,545.00. What a great night and both charities are very appreciative of our efforts. 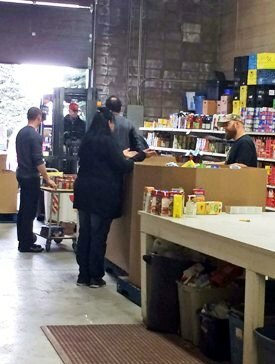 Here are some pictures Dustan took from delivering the food and cash donations in November, as 7 of us spent the day volunteering at the Veteran's Food Bank on behalf of our CPHC. The event successfully raised $3,500.00 for the Calgary Fire Fighter's Burn Treatment Society. 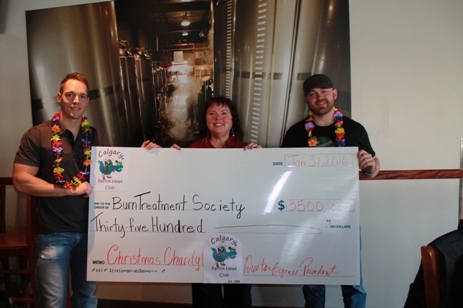 The photo for the actual presentation of the cheque to the Burn Treatment Society is shown below. Thanks to all the Parrot Head members for making this happen -- and a special additional thank you to the volunteers for helping out with the fundraiser! Our Christmas Charity Fundraiser Party 2013 at Donegal Irish Pub was a huge success, with the silent auction, the 50/50 draw and food/drink sales. Substantial funds will thus be given to our charities, Neighborlink and the Veteran's Food Bank. We had a great turnout -- an awesome night with the pH Unbalanced Band! A huge thank-you to everyone who helped with the setup/arrangements for the Christmas party. Also thank you to those who generously donated items for the silent auction. 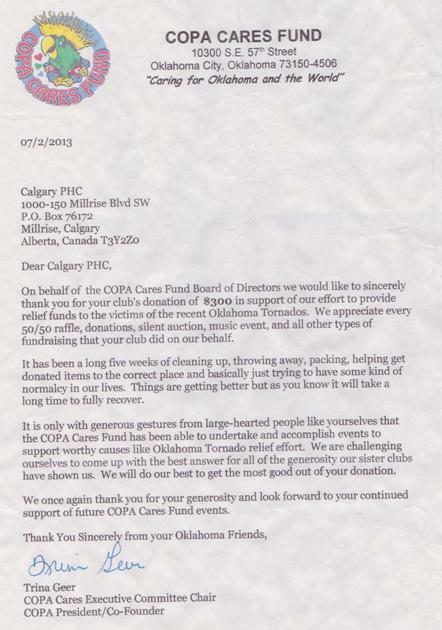 The Calgary Parrot Head Club has received an appreciative thank-you letter from the Central Oklahoma Parrothead Association's "COPA Cares Fund", thanking us for donating to the relief fund for the victims of the Oklahoma tornados earlier this year... Check it out below. Here's more proof that our fundraising efforts are appreciated! A great big thank you to everyone who came out to help the flood victims in High River on Sunday July 7, 2013. We were able to help clean up four different homes. Thank you also goes out to Steve and Cathy for organizing the group of 18 volunteers (and also your previous volunteer efforts in High River), and the many donations of sandwiches, water, muffins, and fruit. Thanks to your generosity, we helped to feed and give water to hundreds of hard working people. Unless otherwise noted, most of the articles on this page were adapted from the newsletter, published by Loralyne M., Eva R. and Deanna L.
It was great to get away for a few days in the wonderfiul warmth of Phoenix Arizona to experience my very first Jimmy Buffett Concert. We’re a group of 10 Calgarians. The day of the concert most of us headed over to Margaritaville for the pre-show fun. We headed over to the tailgating party about 3 hours prior to the concert, beginning the experience I will never forget! 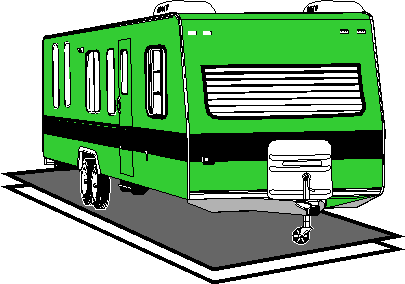 RV’s lined up in the parking lot. Tiki bars with margarita machines running and open for anyone to reload along their walk, no one enforcing any restrictions, certainly a lot of fun! Our concert tickets were grass seating which was another first experience. One huge party on a grassy hill! I was very impressed at how great Jimmy sounded in such an open area! Even more impressed that Jimmy played my favourite song (Bama Breeze). I arrived at the concert hoping that I would know more than just a handful of songs, as I am fairly new to being a Parrot Head. I was pleasantly surprised that I knew all except two or three songs that were played that night! It was most enjoyable to experience Jimmy with great friends! Phins up! Jimmy Buffett won CMT Performance of the Year at the CMT Music Awards back in June. He, with the Zac Brown Band were nominated for their CMT Crossroads episode performance of "Margaritaville" -- and won! Our heartiest congratulations to Jimmy Buffett and the Zac Brown Band! Camping at North Ghost River: private and reserved site (good thing we were behind locked gates as to prevent parrots from escaping and unwelcome intruders (which we had anyways. Damn Park Rangers!). Approximately 20+ adventurous Parrot Heads braved the wild outdoors for this great event. Dampness on the Friday did not dampen the camping and partying for the rest of the weekend. The sun came out for Saturday and Sunday, and everybody got dried out (or at least the camping gear got dried out??). Most of the crew headed down to the makeshift beach by the river for a day in the sun. There were a few minor casualties which happened, flip flops floating away lost to the river gods, one of a Parrots not able to fly up the embankment, not hurting his wings but possibly his tail feathers, the odd drink knocked over, lost or just drank by another Parrot. Then darkness fell upon us. Oh my, our Parrots seemed to get a little more adventurous and “happy” resulting in, an awning being Christened by Johnny’s tiki-torch, a group of Parrots stripping off the feathers and terrorizing the group campground with their nakedness, unfortunately, one of those Parrots decided to “hit the tree before even making it out of the campsite, a lost dog, bumps and scrapes ,which are all part of the camping experience. Thanks to the trailer and 5th wheel crew for bringing the huge tarp, music and lights! Everyone had big fun and all made their way back home safely to YYC; all appendages intact (amazing). Let’s do it again next year!